As before, my thoughts are with Andy's wife and family, and the families and friends of CPT Tom Casey, who was killed with Andy, and SFC William Beaver, who was wounded. 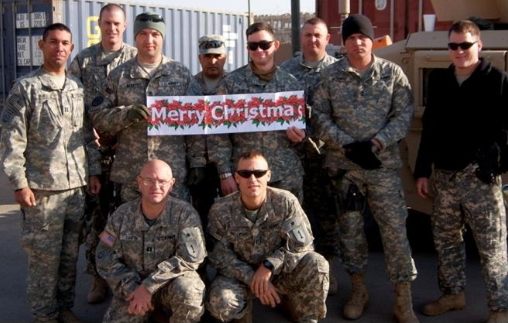 CPT Casey is in the back, second from the left; SFC Beaver is beside him, holding the Merry Christmas sign; Andy is fifth from the left, holding the other end of the sign and smiling. I think Andy would be astonished at the amount of attention his last post received. He could be pretty self-effacing that way: he was about as far as it's possible to be from the sort of blogger who writes because he's convinced that the world is just waiting for his pearls of wisdom. Andy was never sure what kind of impact, if any, what he wrote had. I think he wrote partly because he liked it, but partly because he thought: even if you don't know that anyone will read what you write, all you can do is try your best to put reasonable arguments out there, in the hope that somehow, somewhere, they might do some good. That was the kind of person Andy was. He'd be embarrassed by all the fuss, and genuinely surprised, but deep down, I think it would have meant the world to him. I just wish he could be here to see it. "Major Olmsted died while attempting to get the enemy to surrender so we would not have to kill them. Captain Casey could not leave his commander on the ground. They are the bravest men I have known. They are both heroes. We will carry their example and continue the mission." And while I'm at it: I should have included links to the post Andy wrote on his reasons for going to Iraq; and to his old blog, where you can read a lot of his earlier writing. You can find some more of his work on this blog, both under his own name and as G'Kar. Some of you have wondered why he blogged here under both names, and why we weren't clearer about that fact. Andy stopped blogging here (and on his old site) because he discovered that by doing so, he was violating a DoD regulation (as he describes here.) He loved blogging, though, and so, some months later, he asked whether he could post under another name. I think I made some feeble attempt to talk him out of it, but my heart wasn't in it: I loved what he wrote, and I always wanted to see more of it. On the day he died, he was planning to write a post when he returned from his mission, on Edwards' proposal to terminate all training missions in Iraq. I had no idea what he planned to say, and I couldn't wait to read it. Also: in comments to the last thread, Gary mentioned Andy's silly side. Here, for what it's worth, is a little memorial to his silliness. It's not by miles the best I have, but I don't have the heart to go looking for better ones; this one leapt to mind since it's from the day before he died. The relevant background: Andy and I were chatting on Adium; some calamity had befallen the heat in Andy's room, and he had mentioned being quite cold; I had gone to put my laundry in the dryer, and had just returned. ""They were pursuing some insurgents," Casey's brother, Jeffrey, said. "Major Olmsted got out of his vehicle and was pleading with these three individuals to stop and surrender so that the team would not have to fire upon them and kill them." "Unfortunately, there were snipers in the area, and apparently that's when Major Olmsted was hit," Jeffrey Casey added. "He didn't want to kill these individuals. He was trying to save their lives." After the gunfire erupted, Thomas Casey went to help Olmsted, thinking that the three suspected insurgents were responsible for the shooting, his brother said. "That's when he took his bullet," Jeffrey Casey said. "The fact that a sniper round caught him in the neck . . . that's just one of those fluke one-in-a-million shots."" *Note: I used this picture because I wanted one that had not just Andy, but also CPT Casey and SFC Beaver in it, and also because, of the recent pictures I have of him, this is one of the few that seems to me to be in some sense usable. At any rate, it was sent out in a newsletter, unlike some other pictures I have, which were never published in any way (nor do I know who took them.) If there is any objection to my using it in this way, just let me know; I will of course take it down. The very astute insight of thinking ahead and giving notes, humor and encouragement about life's end is absolutely incredible. There is nothing any of us can do to assuage the anquish of his family's bereavement other than to say it is obvious a Great Guy came our way and left his mark upon this virtual realm with class and esteemed character. A dedicated man is a wonderful sight to see! God always takes the bests. Rest in peace. My husband served under Maj. Andy. What a great guy! He died doing what he believed in! God Rest His Soul! I never heard of Andy, or this blog, until just now. I literally happened upon this through a link in another blog, saw his name on the side, and clicked thinking he was the owner. I was shocked to find what I just read. I feel Amanda's pain, and I wanted to let her know how truly blessed she was to have a husband like Andy. I lost my wife a year ago, and I would give just about anything to have a posthumous expression of her testimony with me. She didn't face the prospect of death like Andy, so she had no reason, but I wish we had done this. I hope it comforts you. The man described in the post sounds like a great American, someone who really knew himself and loved his family, friends, and country. Bless all of you in your loss. I was sent here by the popular ESPN writer Bill Simmons, aka the Sports Guy. If no one has made the Obsidian Wings folks aware he posted a link to Andy's last post in a recent article. The SG faithful is a large group and you will probably be seeing a fair number of strangers commenting about Andy's writing. I obviously did not know Andy and had never heard his name before today. And it's been said and will be said after me and it really sounds like a gross understatement but Andy's from-the-afterlife letter was truly moving. And funny. And very very sad. The parts to his lovely wife made me cry immediately and reading the responses made me keep crying. "There is a vitality, a life-force, an energy, a quickening that is translated through you into action and because there is only one of you in all of time, this expression is unique. And if you block it, it will never exist through any other medium and be lost." Andy maybe did not appreciate his own personal talents and could not have anticipated the kind of repsonse his blog would generate. But what his expression was unique and I'm awfully grateful he was brave enough to put it up here and that even if he is lost it is not. Many many condolences to his family, friends, and blogosphere buddies. Thank you, Major Olmsted, for you service and your sacrifice. May you rest in the peace you deserve. Just wanted to add that hearing about how he died after reading all the things about him was like a punch to the gut. I don't know what exactly I believe about God and the afterlife but it felt like some kind of odd divine justice to hear that he died so nobly, in the service of others so that those left behind can have a story of heroism to remember him by. It doesn't make it any better but it does seem like a fitting memorial to him and his spirit. And who knows what happens when we die but if there is an afterlife I have to think dieing in the act of trying to negotiate to prevent death gets one a first class ticket to paradise. The Simmons piece is here. What a brave soul. RIP, my friend. "Actually, Gary, I think it's here." Actually, that link and comment is by "Brian in Chicago." Bill Simmons doesn't seem to believe in quotation marks. He didn't write those words. He wrote what I linked to. For some reason Simmons didn't mention that he'd already written about Andy. But you're doubtless correct that these folks are coming from that link, rather than from what Simmons originally wrote (which I tried to post a pointer at, but got a "comments are closed" message). I am so sorry to hear about Andy. I knew him in high school. He was a fantastic person then and a great writer. I still have a high school literary magazine with his stories in it. Those stories are the only reason I still have it. The world has suffered a terrible loss with his passing. My sincerest condolences to his family and friends. That was a lot of words that display nothing but fatalism and a superficial fatalism. Who wants to go out quoting such pop culture garbage as "Team America" and Toby Keith? The post makes me feel sorry - sorry that there wasn't more actual substance. "The post makes me feel sorry - sorry that there wasn't more actual substance." Andy's parents, and relatives, read these messages. You've now demonstrated your own values, which are to think this is an appropriate place to offer these deep and penetrating, empathetic, carefully considered, thoughts. In the spirit of do unto others, you might consider longer and harder, next time you feel the urge to inform the friends and relatives and family of someone who has just died of your valuable insights. Or not. Or you can get defensive. The latter is often more likely. You've set an example, but not necessarily the one you intended. Well, I apologize if my comments created any offense. The document was placed in the public realm but of course its context is extraordinary. Blitheness was uncalled for. Sorry. Andy was a very, very smart person. He read a lot, and knew a lot, and he wrote beautifully. He was also one of the nicest and most decent people I knew. If he wanted to go out quoting Toby Keith, that's surely his prerogative. In fact, please delete my comments above, and this one. This is in essence a private page into which the casual Internet surfer should not have intruded. Rest in peace. Thank you for your service and your sacrifice. Thanx for a peek into the world of what's happening in Iraq. God Bless you & your loved ones that are dealing with your unfortunate passing. By the way what's Babylon 5? Thank you for that. God bless. I have not known of or followed Andy; I am just coming to know of him now because of how his 'last post' has touched so many people. Reading what little I have of his, I can say for sure this guy was a major win. Between the quotes he used in his final post and the outpouring of support...he was amazing. His life was a total win. To insist that everyone keep politics out of their thoughts seems an odd way to remember this remarkable man. Andrew was killed in a war; wars are started by politicians. Andrew's blog was a project animated in every post by the persistent hope that by opening our individual experiences to examination and discussion, we inch ever closer aping the truth of our collective existence. To insist that we form our remembrance in a particular way is to say that we can cry over Andrew, but we can't allow ourselves to learn from him. I don't think that's how he would have wanted it. I do ask (not that I'm in a position to enforce this) that no one try to use my death to further their political purposes. I went to Iraq and did what I did for my reasons, not yours. My life isn't a chit to be used to bludgeon people to silence on either side. If you think the U.S. should stay in Iraq, don't drag me into it by claiming that somehow my death demands us staying in Iraq. If you think the U.S. ought to get out tomorrow, don't cite my name as an example of someone's life who was wasted by our mission in Iraq. I have my own opinions about what we should do about Iraq, but since I'm not around to expound on them I'd prefer others not try and use me as some kind of moral capital to support a position I probably didn't support. Further, this is tough enough on my family without their having to see my picture being used in some rally or my name being cited for some political purpose. You can fight political battles without hurting my family, and I'd prefer that you did so. On a similar note, while you're free to think whatever you like about my life and death, if you think I wasted my life, I'll tell you you're wrong. We're all going to die of something. I died doing a job I loved. When your time comes, I hope you are as fortunate as I was. But, as they say, read the whole thing. You're of course free to do as you wish in the matter; hilzoy is simply honoring Andy's final requests, which seems to me to be right in line with honoring Andy, his life, and his death. Please take this as attempt to instruct, rather than admonish. Jerome: To insist that we form our remembrance in a particular way is to say that we can cry over Andrew, but we can't allow ourselves to learn from him. I think that you confuse political campaigning, which yes, at its best is a solid attempt to get other people to learn, with personal experience: what we ourselves learn. Andy didn't ask me not to allow myself to learn. Nor you. My father G'Kar would say, "Wherever you go you leave a part of you behind. When it's quiet listen.."
This is the first I have ever read of Andy. I found this on a post at CrossFit. This man is truly a human being. He seems to encompass the values and mindset that most other human beings could only dream about. To his friends and family: I know it won't be hard to remember Andy for all his greatness. This post will be with me for a long time. So much inspiration from Andy that words will never be able to describe. It's astonishing what a brave and vibrant soul Andy Olmstead was. He has definately made the cost of war more real to me because as he mentioned, it had become more of an academic question (in regards as to whether to go to war in the first place, as he mentioned) and by getting to hear his voice in his blog it made it a lot more personal to me because I feel as if I had gotten to meet him. I also realize that there are thousands of other lives involved in the Iraq war and people whose lives I will never glimpse who are also worthy of our respect and mourning. I am astonished at what a good and intelligent person he seems to have been and I feel a deep admiration for his devotion to his principles and duty. I feel humbled and saddened and truly greatful for his life. I think that by catching a glimpse of his light, I will attempt to live my life in a more exemplary fashion with a greater devotion to my principles and duties. Andy, I wish I had gotten to meet you and to have had some good conversations with you. Thank you for your little dent in the universe. My condolences to his wife, parents, family, brothers in arms, and friends. Just wanted to again thank everyone for their kind words and insights. Andy was truely someone who lived life fully and who explored the historical, present and future issues that humanity and America were and are faced with. As a family member, I appreciate the restraint bloggers have shown in the political arena as requested by Andy. I am glad we all have been given a learning opportunity whether it is about the war, manners and respect, or life and death. We will all die sometime and I hope each of us will be given the respect and love that Andy and his family have been shown on this site. I just want to send my condolences to both the families of MAJ Olmstead and CPT Casey. I knew both of them briefly as we served and trained together at Fort Riley, Kansas preparing for this very mission in Iraq. They were good men doing their best, serving their country and they were my brothers-in-arms. It is a touch mission....unfortunately, you have to be here to truly understand how tough it is. I am still in Iraq right now as I am writing this with a few months left in my mission. We left FT Riley together and separated in Iraq and I did not have a chance to see them again. Since I find myself unable to put thoughtsd to words, I chose instead to put words to music. Taps, unofficially. Godspeed and good rest Sir. Thanks, Jay. That was beautiful. I never read Andrew's blog before today. I saw the link on a newscaster's web site. Despite the fact that he was a total stranger to me, I found myself crying at my kitchen table. I just wanted to write with the hope of expressing to his family (who I am sure already knew he possesed such traits) that your son, brother, lover and friend was able to touch total strangers with his honesty, integrity and moral strength. I am so very sorry for your loss. "This man is truly a human being. Posted by: Zach | February 27, 2008 at 10:31 PM"
Just a quick note to say that there is a new Andrew in the world. Major David Willis and wife Lori have named their new son Andrew Christopher Willis. Mother and child are doing fine. Dave was one of Andy's closest friends and gave a eulogy at Andy's memorial service. God bless the two of them and Little Andrew. I just received word from theater that two members of Andy's team were killed by an IED strike in Balad on Sunday. RIP CPT Ulises Burgos and SPC Matt Morris. I did not know this man, but I know enough of him from his amazing words to know that he is a hero. Go well, G'Kar! As the granddaughter of a Navy "lifer" who served during WWII, the daughter of an Army "lifer" who did two tours in Vietnam and the sister of an Army man who spent time on a "peace keeping mission" in Bosnia I would like to say Thank You to Andrew Olmsted and the family and friends who stood by him while he served our country. It's like my dad said "Sometimes it takes the life of one man willing to fight to secure the freedom of many." You are all in my thoughts and prayers. I flagged this blog when it came out, I did not have to heart to read it at the time. I have some experience with the horrors of war, equal horrors for everyone one both sides. Bismarck put it very well when he said that God is on the side of the biggest cannon. Tennyson said it even better when he wrote: Ours is not to reason why, but to do and die. Andrew was not a victim, Amanda is. Memorial Day weekend has made me think about Andy and this place once again. I never knew Andy personally and I am not much of a blog follower. However, after reading some of Andy's posts and the beautiful tribute to him here I feel like I know him and you a lot better. I identify with a lot in Andy's life. I also served in the military and understand a devotion to one's country. Sadly though, I grew out of a lot of that sense of duty. I went on with my life. I went to college, then law school, and I have led a pretty selfish life since. Selfish in the sense that I haven't thought a lot about others with the exception of my immediate family. Since reading this thread back in January, I have tried to do better. I volunteered to coach in a Spring Football league for at-risk 8th graders in a town about 20 miles away. It has been one of the best decisions in my life and I feel so much better for doing it. I tell you this because it wouldn't have happened if I didn't come here and hear about Andy. Andy's story touched me and I wanted those who remember him this weekend to know that. "And in the end, it's not the years in your life that count. It's the life in your years." Chris: thanks. I think Andy would have been really moved by that, and that it would have meant a lot to him. We have done our best to do what Andy would have wanted on a very emotional day. I have a picture of Andy and Eric as small children that we keep out during today. A good reminder of better times. Thanks to all the commenters. You will never know how much your kindness has meant to all of Andy's extended family. Hi Wes -- my best to you and your family. As always, I'm thinking of you. I don't know, but Andy just came to mind today. Maybe it was the great Flag Day Post over at This Ain't Hell...I don't know. I thought of him on Memorial Day, but was nowhere near a computer. I hope that family and friends are doing alright. I get misty just thinking of the profound effect he had with his words on all the people he didn't know, me included. I like knowing that his words are immortal. It's a great day where I am, Andy. Thanks for making me stop and smell the flowers. For those who are interested, MiTT 0511 has now returned to the US. Nancy and I met with them over the weekend in Kansas. Wil Beaver was awarded a Silver Star for his heroic acts on January 3, 2008 which saved many US and Iraqi lives. This whole unit consists of people I would consider heroes. They gave up a year of their lives to help defend this country and try to improve the Iraqi way of life. Their families also deserve our thanks for their sacrifice and the travail they went through waiting to hear if their loved ones would survive this time of tension. For the four who gave their lives in defense of this country, and the two who were wounded, I can only say a very inadequate 'thank you'. Remembering Andy seemed to be the right thing to do, today. Bringing sanity and compassion out of darkness and chaos. A brave and good person. When I read the article about Andy that my husband sent me I cried...and I didn't even know the man...but what a man. He loved his country and the principles for which it stands. To Amanda his wife, I say Thank You and God Bless. I've come back to revisit Andy's comments today, in March, '09, having saved the link for just this. His words ring as true as ever, if not more so. I hope his family is finding their way without him, though I can't imagine the pain they have endured thus far. But what a wonderful good bye. They have this at least, as a remembrance. We should all be so lucky as to be blessed with the foresight and intellect to reserve such a moment against the inevitable; to marvel at our short time in this place, as well as an ability to acknowledge our faults, and hope against hope our tiny successes make some small impact on our slow motion progress toward the advancement of humanity. Clearly, Andrew achieved that, and in far less time than most of us are allowed to try.